Channeling spirit guides, archangels and ascended masters, Lynn Baribault offers an intuitive and practical guide for parents to use when raising their children. “How to Raise Your Children with Wisdom and Awareness: A Channeled Book” (published by Balboa Press) combines shared wisdom, exercises and prayers to guide parents in their role of raising children. Baribault is launching a marketing campaign to broaden the reach of her book. Parents and children can learn a lot from one another and through “How to Raise Your Children with Wisdom and Awareness,” parents are given insight into how to best achieve this. Parenthood has its challenges as each parent and child brings with them their individual personalities and experiences. Baribault hopes her book provides assistance and guidance in its own unique way. 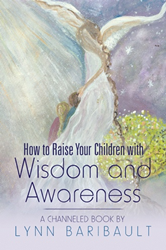 The book is available for purchase at: https://www.amazon.com/Raise-Your-Children-Wisdom-Awareness/dp/1504383737. Lynn Baribault's first vision came to her when she was approximately 6 years old. It was not until she became a volunteer living and working in Laos that her intuitive abilities actually started to take up more time in her life. Over the years, Baribault has attended many courses on intuition and energy healing. She is a qualified ohana generational healing practitioner, quantum crystalline energy practitioner and a preseli healing with the ancestors practitioner. “How to Raise Your Children with Wisdom and Awareness” is her first book. Born in Quebec City, Canada, Baribault now resides in Guelph, Ontario, Canada with her two daughters. She is also a teacher who continues to thoroughly enjoy teaching and learning from children.